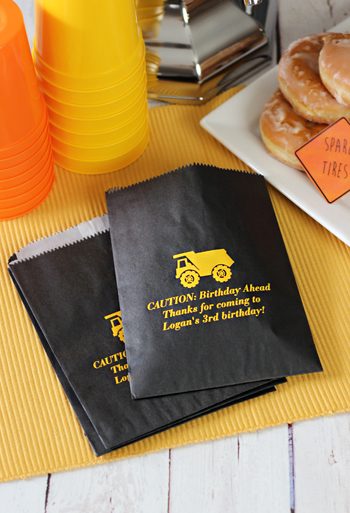 Send birthday guests home with candy from your buffet, a slice of cake, or other homemade treats in these grease-resistant, wax-lined favor bags. Personalize with a birthday party design and three lines of text to craft your own thank you message to friends and family. 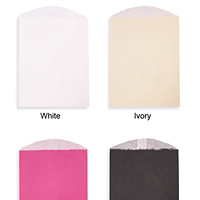 Choose from 4 bag colors. 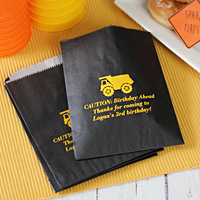 Each flat paper bag features a glassine, wax-coated lining to keep oils and moisture created from cake, chocolates, and desserts from bleeding through to hands, clothing, and linens. I totally love my candy bags! They are the perfect size. loved the bags, only issue I had was having to contact them because they didnt send me my full order.